For more about the Wikipedia blackout, check out Prof. Edward Lee’s forthcoming book The Fight for the Future: How People Defeated Hollywood and Saved the Internet–For Now. January 18, 2012 was a day that changed the Internet forever. Wikipedia, Google, and thousands of other Web sites went “black” in a day of self-censorship, the largest online protest ever. Their target was a controversial copyright bill called the Stop Online Piracy Act (SOPA), which would have authorized the U.S. attorney general to obtain a court order to block Internet access to foreign Web sites accused of criminal piracy or counterfeiting. SOPA’s critics believed its domain-name blocking would amount to censorship, inevitably blocking access to legitimate sites without due process and in violation of the First Amendment. In that dramatic day of protest, the Internet showed its awesome power. Ten million people signed online petitions against SOPA. Eight million looked up their Congressional representatives’ contact information on Wikipedia’s directory and then went to the representatives’ Web pages, inadvertently causing them to crash from all the traffic. Three million people emailed and one hundred thousand called their members of Congress to express their opposition to SOPA. The day marked the culmination of months of intense grassroots efforts across the country. Aaron Swartz, who died tragically last week, was one of the first people to sound the alarm about SOPA’s predecessor bill in 2011. And he did something about it: he founded the nonprofit Demand Progress, which proved to be instrumental especially in the early opposition to SOPA. But the fight against SOPA was not the work of one person. It was the work of many people who, like Aaron, shared in the belief of “the freedom to connect” on the Internet, unrestricted by government policing. In the end, the historic day of Internet protest achieved something remarkable: it defeated Hollywood, millions in lobbying dollars, and strong bipartisan support on Capitol Hill. For the first time, people stood up and defeated a copyright bill they believed threatened their Internet freedoms. Although some of the SOPA sponsors afterwards tried to downplay the popular opposition as “misinformed” about the bill, the school of constitutional theory known as popular constitutionalism provides a more compelling explanation. In key moments of our nation’s history—including the first recognition of the freedom of the press, jury nullification of the Alien and Sedition Act prosecutions, and opposition to restrictions on abolition speech—the people, not courts or Congress, were the ones who defined and defended free speech. The popular opposition to SOPA was another defining moment for speech. People sought to protect their right to a “free and open Internet.” Although the contours of this right are still being worked out, at the very least it entails freedom from government policing of the Internet that may chill speech or result in overbroad takedowns of legitimate Web sites. Under the people’s test of First Amendment scrutiny, SOPA flunked. Despite the victory in stopping SOPA, the free and open Internet is by no means secure. 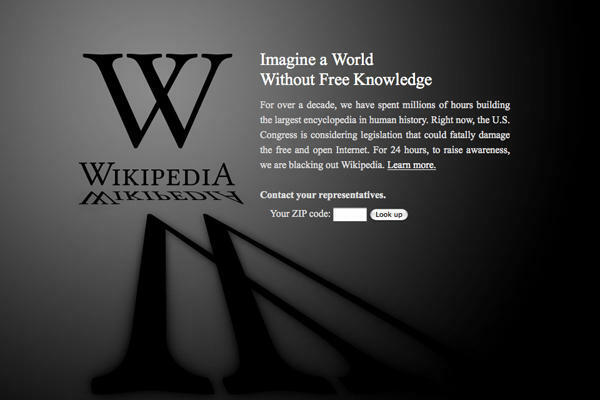 The Wikipedia blackout was largely defensive, an effort to stop bad legislation. It didn’t produce affirmative legal protections for Internet users. The freedom of the Internet is not codified in any legislation or court decision, much less the Constitution (at least not expressly). Although Senator Ron Wyden and Representative Darrell Issa proposed last year an Internet Bill of Rights on their “Keep the Web Open” website, that idea appears to be light years from consideration in Congress. Their proposal enumerates ten basic rights all Internet users should enjoy, including freedoms from censorship and government obstruction. (Brazil was far closer to passing an Internet Bill of Rights in 2012, but the Marco Civil da Internet bill has not come up for a vote yet.) Just last year, the U.S. Supreme Court reaffirmed its controversial view that copyright law typically receives no First Amendment scrutiny at all—ironically on the same day of the Wikipedia blackout, when millions of Americans were invoking their First Amendment rights to protest the copyright bill SOPA. And the executive branch continues to seek stronger anti-piracy measures in international trade agreements such as the Trans-Pacific Partnership (TPP), which are negotiated behind closed doors. The free Internet will rise or fall on the involvement and ingenuity of the people, not on courts or lawmakers. For its part, Hollywood, still smarting from the SOPA protests, concedes that it won’t be pursuing similar actions this year. Instead, Hollywood has shifted its efforts to stronger enforcement against online piracy through Internet service providers. Under “six strikes” policies or the Copyright Alert System (CAS), Internet subscribers accused of infringement are subject to a series of corrective steps, such as warnings, mandatory copyright education, and slower Internet speeds for a few days. There isn’t much due process. Users won’t be able to contest a measure in arbitration until the fifth and sixth strikes, and will have to pay a fee (e.g., $35) to do so. The fee is refunded if the user prevails. The ultimate penalty—denial of Internet access—isn’t required under six strikes, but there is nothing stopping it from being adopted one day if six strikes fails to curb online piracy. (The French law HADOPI, the inspiration for six strikes, includes denial of Internet access.) In effect, Internet regulations are being outsourced to private entities and private policies, which are not subject to any First Amendment scrutiny. Private censorship is perfectly permissible under the Constitution. This fight is just beginning, though. Whether people can secure their freedom of the Internet is still up for grabs. On the positive side, groups and activists who defended the free and open Internet are far more organized now than they were a year ago. Some of the organizations involved in the SOPA protests, including Fight for the Future and Public Knowledge, indicated that they would be seeking copyright reforms this year, building off last year’s success. An Internet Defense League has even been created. Hacktivist groups such as Anonymous continue to exert their power in the name of a free and open Internet, albeit by means that many members of the free Internet movement do not condone. Pirate Parties—political parties started in Europe to defend the open Internet—have also offered credible proposals for reforming copyright laws in the digital age. Great Britain has taken an important first step in recognizing the need to make copyright more flexible for the twenty-first century by adopting the recommendations of Professor Ian Hargreaves, including his proposal for a digital copyright exchange to streamline licensing of copyrighted works online. At the same time, Internet restrictions abound. Countries such as China, India, and Russia already use Internet censorship to quash political dissent. The strong bipartisan support for SOPA in Congress showed that U.S. legislators are open to entertaining similar government policing of the Internet, at least when it comes to the never-ending war on piracy. Likewise, Hollywood’s turn to private Internet policing through six strikes policies shows how corporations can be equally as powerful as governments in controlling Internet use of millions of people. Despite these forces, don’t count the open Internet out just yet. What the Wikipedia blackout teaches is that the preservation of the free Internet will rise or fall on the involvement and ingenuity of the people, not on courts or lawmakers. Wikipedia is a Web site, but it is also a community of thousands of volunteer writers around the world—so-called Wikipedians—who decided a year ago today to take a political stand for the first time in its existence. The decision ran counter to the site’s apolitical stance and was in considerable tension with its overriding mission to spread free knowledge to the world. Nevertheless, they risked Wikipedia’s position of neutrality, not to mention its reputation, to fight for the freedoms on the Internet they hold dear. So did millions of others who joined the historic protest. Whether that high level of civic engagement can ever be repeated is hard to say. We haven’t seen it yet. The recent unsuccessful proposal to shift Internet governance power to the United Nations’ International Telecommunications Union drew some protests, but nothing like the popular uproar against SOPA. The United States continues to negotiate the Trans-Pacific Partnership, including its Internet regulations, largely behind closed doors and without much public outcry. But before writing off the free Internet movement, remember that Internet tools are only likely to get better at mobilizing people and building viral campaigns in the future. Plus, today’s children—“digital natives” who grow up with and learn from the Internet almost from birth—are far more likely to be defenders of Internet openness than in favor of greater restrictions. Even if the Internet blackout of 2012 is never repeated, it stands as an important lesson for generations to come: the Internet can’t stop the next SOPA, but people can.